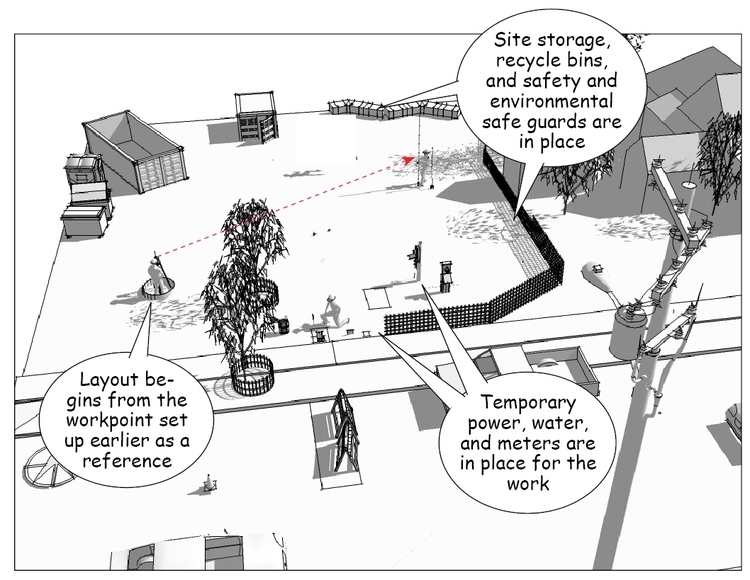 In an ideal world, construction starts once the general contractor has the site ready with temporary utilities, storage, recycling bins, and safety and environmental safeguards in place. 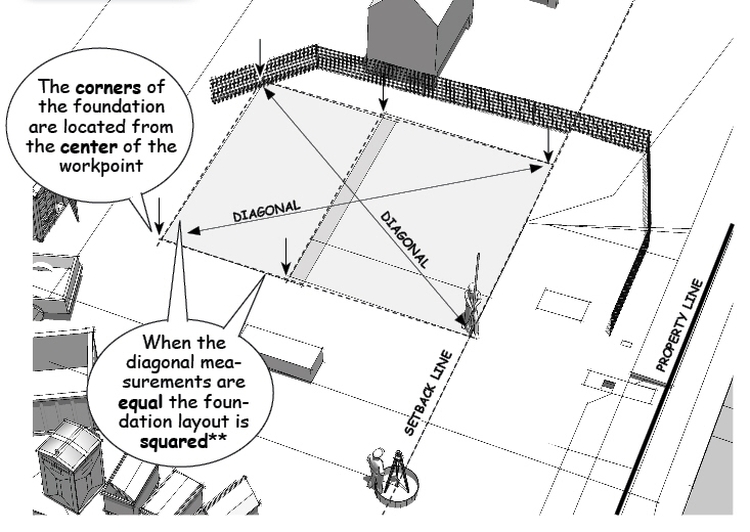 An accurate layout is important, especially in high density areas when the building is near a setback or property line, because its final height and location must often be verified by a licensed surveyor prior to being granted a certificate of occupancy. 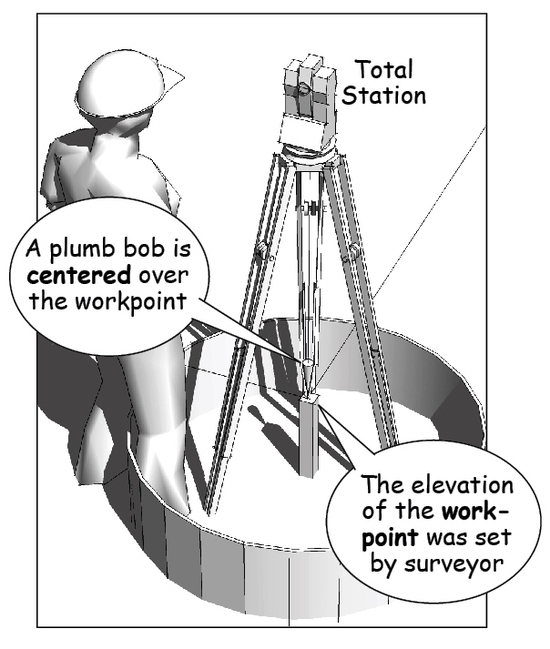 The layout begins by positioning a surveying instrument directly over the workpoint that was located during start-up planning. As noted earlier, this workpoint is a field reference for both an elevation above sea level and a precise location on the jobsite that corresponds with the elevations and dimensions shown on the construction drawings. 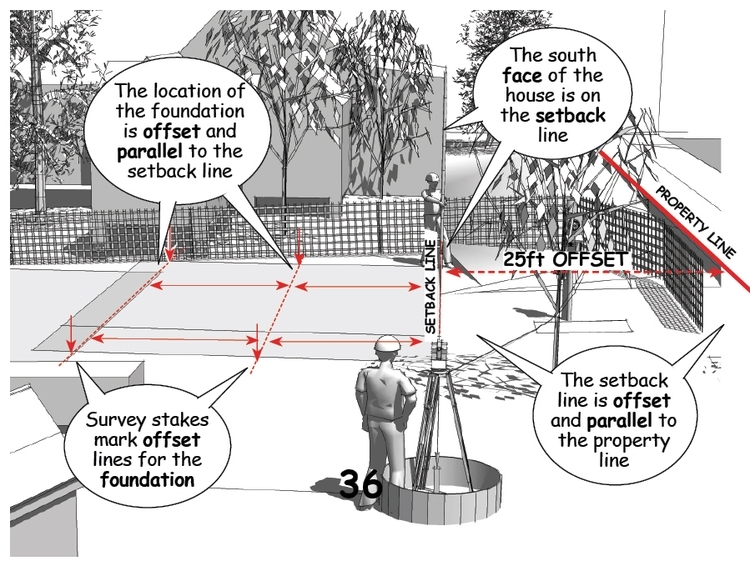 For straightforward foundations on an open site, most builders would simply measure parallel offsets from a predetermined reference line sighted along the setback or property corners. 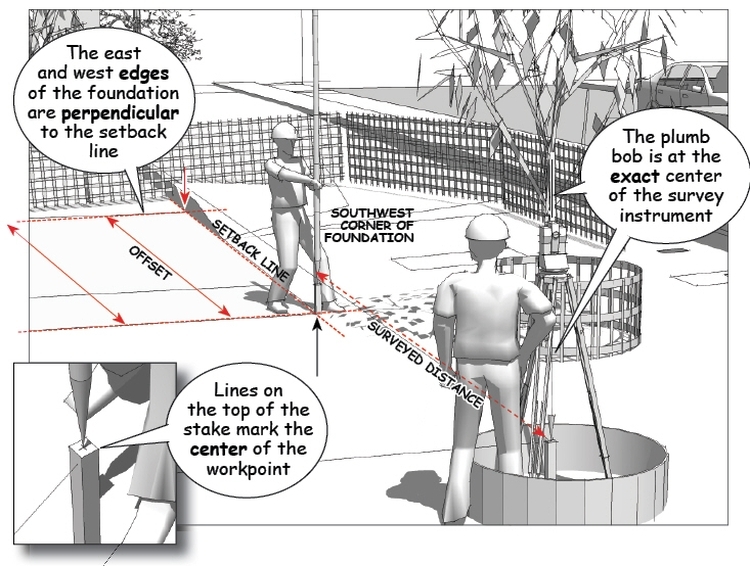 Measurements along the length of the reference line from the workpoint are taken from dimensions specified on the construction drawings. 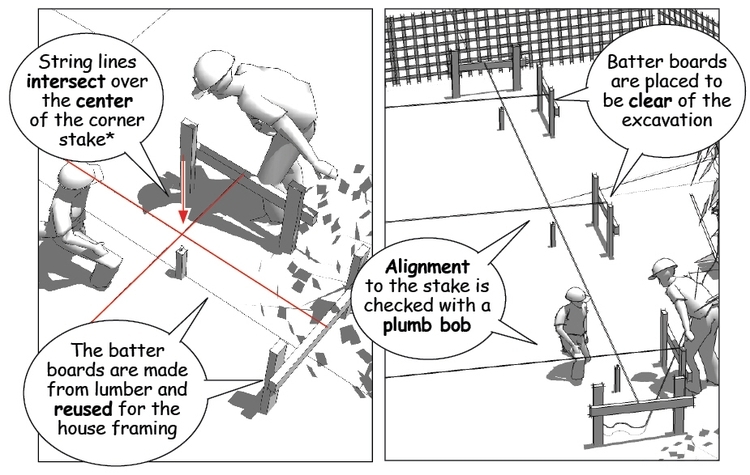 A light weight builder’s transit/level is then repositioning over stakes located at critical distances along that line to layout the walls or objects perpendicular to, or along arcs left or right of, this reference. 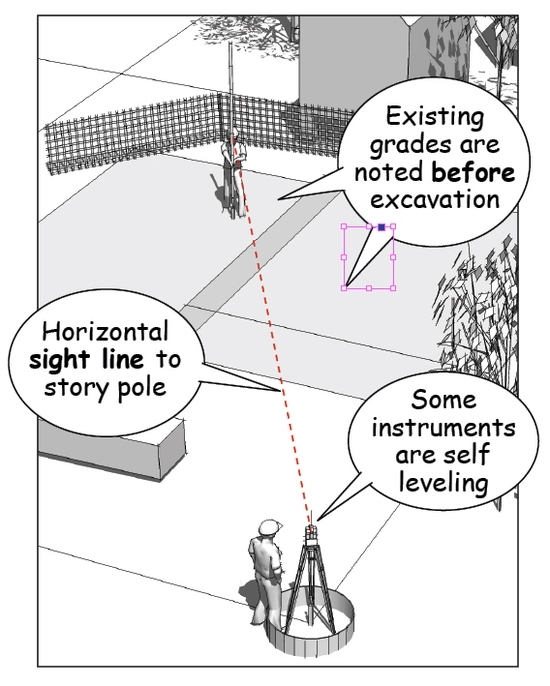 The layout is then checked with optical lasers, GPS, or by diagonal field measurements to square up the foundation corners. Once the corner stakes are set and checked for accuracy, string lines are extended from temporary batter boards placed well outside the area to be excavated. Important is that the horizontal member for each of these batter boards is level, and that they all share the same elevation as referenced from the workpoint. The batter boards allow builders to carefully position string line intersections over the center marker on the corner stakes. They will also be used to gauge the depth of the excavation and the height of the foundation walls and footings as the work continues. The string lines are tied to nails on the upper surface of the batter boards. They locate the outside face of the foundation walls and any interior stem walls, special conditions, or changes in elevation within the excavated perimeter. 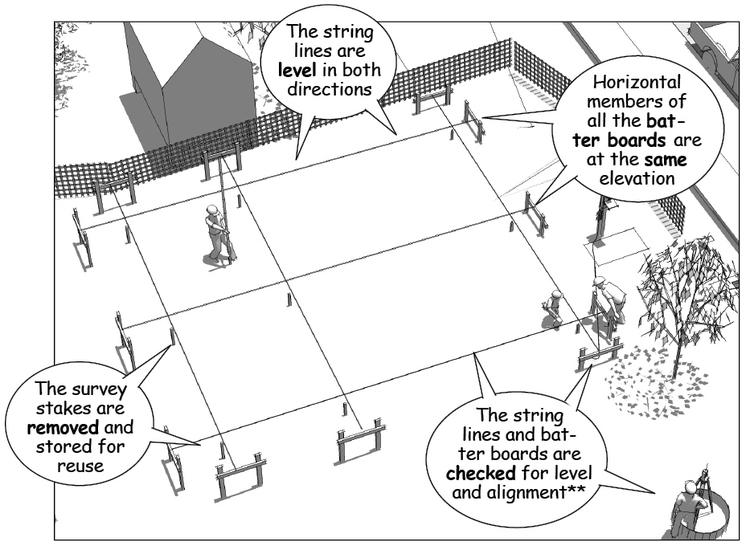 Once the string lines are checked and labeled, they can be untied and set aside in order to clear the area for the equipment needed to start the excavation. The strings can then be quickly reset during the excavation to check progress, verify the depth of the cut, and re-establish the foundation corners.